From California’s North Coast to the Eastern Sierra Inland Desert Region, European wild boar, feral hogs and crossbred species of both, range and flourish in the most populated State in the union. Wild boars are awesome animals to hunt. They’re dangerous, alert, smart, vicious and challenging. They have an attitude and can run both fast and far when threatened. Without warning, they may quickly and easily turn and charge an unsuspecting challenger and it’s a tragic mistake to underestimate their instinct to survive. Awkward in appearance, they are deceiving. Brawny, with well built legs, massive chests and shielded shoulders that cover powerful muscles, they bound effortlessly up and down the steep, rugged terrain of their chosen habitat. 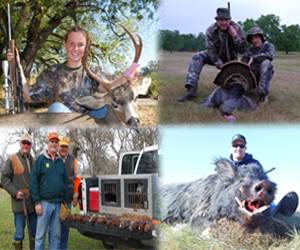 At Red bank outfitters you will find yourself enjoying the scenic view from a utv on over 18,000 acres of premier hog hunting country from open rolling hills doted with majestic oak trees to deep draws with thick cover consisting of poison oak and Manzanita thickets, Some of the hog’s favorite bedding habitat. Other ranches consist of thicker studded oaks mixed with Manzanita cover over flatter terrain and then for the brave at heart we could go into a thousand acre Mecca of eucalyptus grove with dogs and get close and personal with an open sight big bore rifle in hand.